We all know the situation. You buy a few gallons of paint to paint a room. You proceed to paint the room. And then you have a few gallons of paint left over. Where and how should you store it all? The first thing you’ll want to do is seal the can of paint. Do this by wiping the edges of the lid, making sure no paint will stick between the lid and the can’s seal. Next you’ll want to press the lid down. Do this by either using a mallet to tap the lid down, or cover the lid with a piece of wood and tap the piece of wood with a hammer. Never hit the lid directly with something dense like a hammer, as this could cause bends and breaks in the lid, preventing a secure seal. Next, store the paint cans in an environment not susceptible to extreme changes in heat. 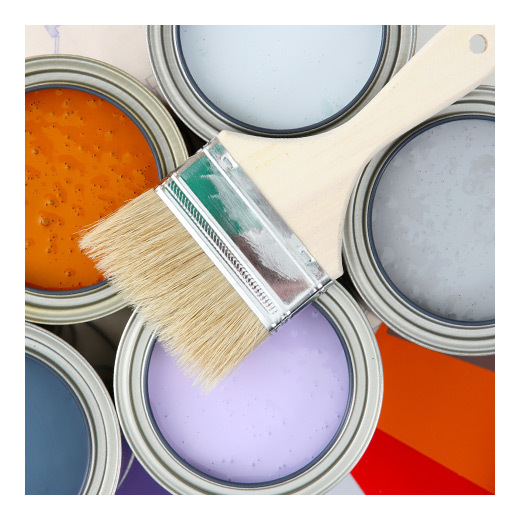 Cold air can cause latex paint to separate and heat can cause it dry out. If moisture is consistently present in the environment, elevate the paint cans to keep them dry. Reopening paint cans is an awful experience for most, especially if left to their own devices. You’ll definitely want to avoid using screwdrivers and hammers because if you bend the lid, you might not get a good seal in the future. Rather, purchase a paint can opener. Then reopening won’t be such a huge deal. Lowe’s recommends the following, to test your paint. If you have latex, smell it. If it emits a rancid odor, it’s bad. Secondly, if film is on the top, remove it. Stir the paint. Then test the paint by brushing it on newspaper to discover whether it is clumpy. If it is, then it’s bad. If you have an oil-based paint, it is good for up to fifteen years so long as it hasn’t been exposed to extreme temperatures and was sealed adequately. That’s it! It’s pretty simple. Follow these tips to know how to store paint and whether paint you’ve retrieved from storage is good or bad! The post How to Store Paint appeared first on Apartments For Us.